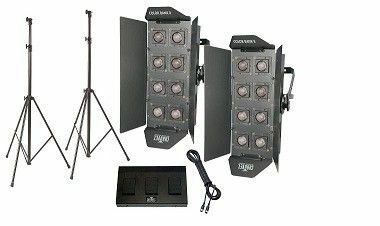 The Chauvet CH-159 Color Bank 8 is a compact, wide floodlight with barn doors. It is ideal for providing basic area washes for small stages in confined spaces, yet is small and portable enough for mobile applications. Chauvet includes 8 gel holders, 4 gel sets, 16 programs, multiple chase modes, sound-sensitivity, override, and optional footswitch operation. Multiple CH-158 Color Bank 8 units can be linked.